Every now and again, a book comes along that catches you unaware and forces you to reconsider ideas that you’ve held, unchallenged, ideas that you may not have even realized you held in the first place. I’ve been pagan long enough that the more typical “This is how I practice my path” books don’t tend to do that – I enjoy them, I love learning about what other people are doing, how they interact with the spiritual realms and how they integrate those interactions into their lives. I find it fascinating, but they don’t always pull me out of my self, out of my thought patterns and expectations, and make me consider what might be different, if. Rooted In the Body is a book that takes us into those uncomfortable places. What if I was not as able-bodied as I am? What if I was blind, deaf? What if I struggled with addictions that took over my life? What if I was less normative when it came to my mental state? I may joke about being “crazy”, but being outside what mainstream society considers “normal” is not the same thing at all as not being able to touch in with what that “normal” is. What if, what if? These questions are important, and they are dear to my heart. My partner, Beth, struggles with arthritis and a chronic pain condition that has seriously impacted her quality of life. Over the last few years her struggle to work full time has taken its toll, and she’s been forced to scale her hours outside of the home way, way back. We’re lucky in that we’ve been able to afford it, but when we reach the end of being able to afford it she isn’t going to miraculously be able to return to the work force. I cannot imagine people in similar situations without any sort of support network, and my heart breaks for them. A decrease in ability and health brings to mind a few questions. Like, what about the idea put forth in many groups that one ought not worship when one is ill? I know some believe that about holding Circle; I know others believe that about approaching the altars to our Gods. But what about those of us who are never “well”? Do our Gods abandon us when we are not at our best? When we are scared, or in pain, or at the edge of our ability to cope? I certainly hope not; I definitely do not believe so. Rooted in The Body, Seeking The Soul introduces us to a number of people, pagans and professionals alike, who are asking and answering these questions. The book has a number of interviews with professional counselors and therapists, discussing the particular challenges that pagans face when it comes to the medical health field – how does one find therapists when one is in a non-pagan-friendly part of the country, who will not hold one’s pagan faith as an example of delusion or unstable mental health? What resources are lacking, and how can we work to build up support networks for fellow pagans in need? 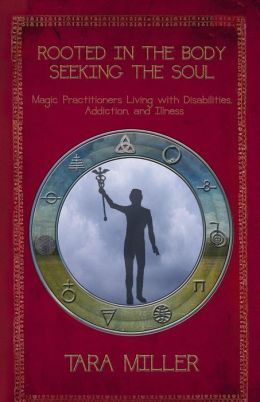 The book also shares with us some of the struggles, experiences, and resolutions of pagans dealing with disability, addiction, and mental health issues. Where, as a community, do we fall short in including those of us who need extra support? How can we best offer assistance? What do we do when so many of us are facing our own challenges? How do we manage to care for ourselves as well as being able to help support others? Don’t misunderstand me – Rooted in the Body, Seeking the Soul is an uncomfortable read. But, it’s an important one. For me, it’s been a timely reminder that, for all the variety to be found within paganism, for all that many of us cry (myself included!) that we are not united into one community, but that we are rather a collection of many, much smaller communities, in this we really ought to be united. There are so many places where paganism can be used against us, to deny us help, to be used to showcase that we are unwell, times when paganism is misunderstood, when this tool that is our faith, that can provide us with fortitude is instead used against us. Reading this book has brought me to that uncomfortable realization that a lot of the things that I get caught up in arguing about simply do not matter, not when there are quality-of-life concerns being faced by others. I am excited to see this book hit the market, and I hope that others like it will follow.